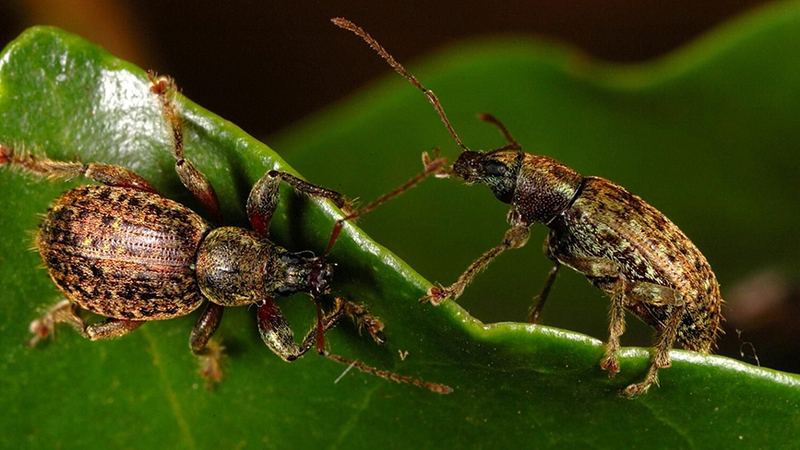 With as many as 120 recently discovered weevils placed in the genus Laparocerus, it now hosts a total of 237 known species and subspecies. They are all flightless beetles and most of them endemic (living exclusively in one geographic location) to a single island of the archipelagos of Madeira, Selvagens and the Canary Islands (17 islands in total). Only two species inhabit Morocco, the nearest continental land. Independent Canarian entomologist Dr. Antonio Machado, who has been collecting and studying this genus of weevils for the last sixteen years and researched 46,500 specimens so far, was helped by geneticist Dr. Mariano Hernández, from the University of La Laguna, Tenerife, Canary Islands, Spain, to undertake a phylogenetic study using three mitochondrial genes and one nuclear gene. The resulting phylogenetic tree also allowed for estimating the whole evolutionary process along a timeframe of about 11.2 million years. Their study is published in the open access journal ZooKeys. The molecular analysis confirms that all Laparocerus weevils have a common evolutionary ancestor (monophyly), but could not clarify whether that ancient founding species arrived from southern Europe or northwestern Africa. The two extant Moroccan species were found to be the result of a back-colonisation from the Canary Islands to Africa, and not the ancestral source lineage, which unfortunately is still unknown. Colonisation of Macaronesia started in Porto Santo, Madeiran archipelago, which is the oldest island, and from there it ‘jumped’ to Madeira and the Desertas. The colonisation of the Canary Islands started shortly after, and it basically moved stepwise from the east to the west in line with the decreasing age of the volcanic islands. Yet, there have been several back-colonisations, as well (see map). Large islands, such as Tenerife (2034 km2), ended up with 65 species and subspecies. Globally, there is an outstanding ratio of one endemic Laparocerus for each 35.7 km2; a record not beaten by any other genus of plant or animal in Macaronesia. The evolutionary process responsible for such richness comprises sequential radiation events in these archipelagoes, each generating several monophyletic groups. These groups, 20 in total, have been recognised as subgenera of Laparocerus, and five of them — Aridotrox, Belicarius, Bencomius, Canariotrox, and Purpuranius — are described as new to science in this study. Colonisation routes, habitat shifts, disruption of populations by volcanism, dispersal by massive landslides, and other relevant aspects for adaptive and non-adaptive radiation, are largely discussed and confronted with previously published data referring to other groups of beetles or to other biological organisms (spiders, bush crickets, plants, etc.). The scientists hope that, in near future Laparocerus will merit sharing the podium with Darwin´s finches or Drosophila in the studies of island evolution”.